When specifically addressing the issue of having the horse on the bit, start by warming up for 10 to 15 minutes at all three gaits. Then allow your horse to relax on a loose rein. 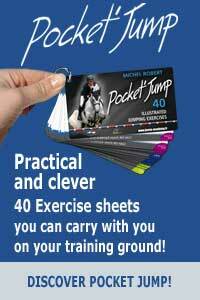 During this pause, you will imagine and plan your training session depending on your horse and what you wish to achieve. I usually advise riders to start by riding at a walk on a circle with a diameter of about 10 to 15 metres. As I am sure you have noticed, horses are not symmetrical: they usually bend better on the side their manes fall. It is therefore preferable to start on this rein, the horse will assume the correct attitude more quickly and this is better for its mental state. Remember, to improve the weak points it is always preferable to work on the strong ones. Make the circle progressively smaller, request the horse to bend increasingly around the inside leg. When you feel that your horse is ready to yield with its body and its poll, cease asking, while relaxing the tensions in your own body. 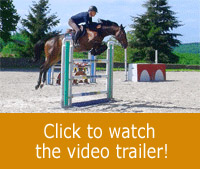 Forestall its reaction: soften as soon as you feel your horse is about to yield, while keeping a light contact. While reducing the size of the circle, keep an eye on the forward movement because turning often results in a loss of impulsion. The horse must bend from the tip of its nose to its tail, to perfectly match the curve of the circle. If the horse moves towards the inside of the circle, push it back using only your inside leg. 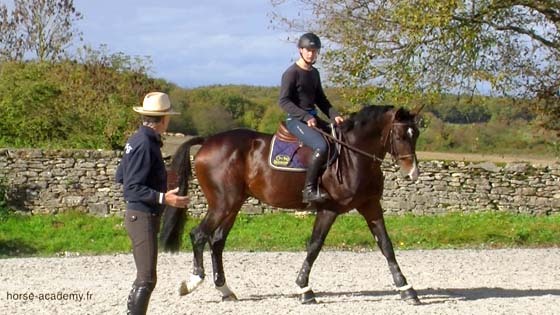 Yielding is not complete unless the horse’s back is in the correct position, hence the importance of starting at a slower and more extended gait on a curve. In an exercise like this, 90 % of my mind is busy analysing the sensations coming from my horse, and more specifically, what is happening with its hindquarters. I advise all my pupils to also place themselves in this frame of mind. Unfortunately, one observes with what degree of unkindness certain riders vent their inability and rage on their horses’ mouths. They focus on the horse’s weak point and by continuing to torment it, end up exhausting and destroying it. One should, on the contrary as we have said, rely on the horse’s qualities to allow its weak points to vanish.